I have been attending a free online class called Curanderismo Part 2: Traditional Healing of the Spirit/Energy and this week’s class we were shown a video on Healing Fright and Shock (Susto). They used a Smudging Herb bundle and made an oil to use to help clear the person. Put bundle together and “swat” at the person setting intention to clear away that which no longer serves. Put all in a glass jar and cover with rubbing alcohol. Label jar and oil will be ready in 2 weeks. Can then be put in glass bottle with spray nozzle or used to make an herbal salve. 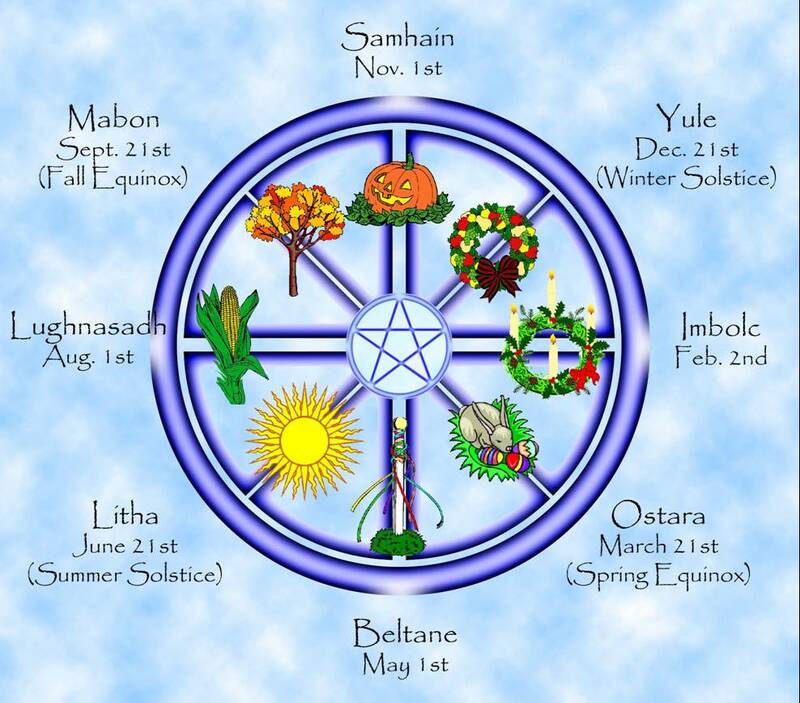 Posted on September 30, 2015 February 23, 2017 by Wolf Woman WaysPosted in RecipesTagged Herbs, Pagan, Pagan Paths, Relase Massage Oil, Smudge Bundles, Witchcraft. 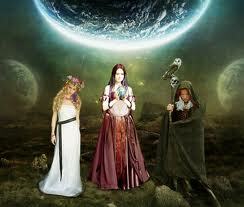 I woke up thinking about Madien, Mother, Crone or the three aspects of the Triple Goddess. I started thinking about my granddaughters, daugthers, my mother, grandmothers and myself. How we all have inner and outter beauty no matter what our age. A Maiden’s inner beauty comes from discovering new things in the world. Her outter beauty can come from allowing the inner beauty to shine through without using make-up to cover what they think of as flaws. A Mother’s inner beauty comes from knowing she can have a child to love and care for if she chooses to. Her outter beauty comes from knowing she is a strong woman, caregiver, mother, wife or signifigant other. A Crone’s inner beauty comes from having lived a life that was and is full of wonder, from learning from her mistakes and being able to pass that knowledge and wisdom down. I hope being the only Crone left in my direct blood line that I can help the MOther’s and Maiden’s as much as my ancestor did for me. A Crone’s outter beauty comes from the wrinkles, gray hair and knowing she is helping the newer generations to be strong men and women. In other words no matter how young or old we are we have something to share with the world and each of us are uniquie. 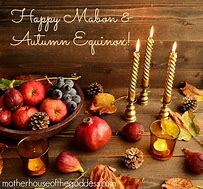 Blessed be dear sisters and friends. I don’t think of them as weeds. The young leaves can be eaten raw or cooked, with a mild flavor akin to spinach (leaves develop a bitter taste as they mature). The root, which has a sharp, bitter taste may be brewed into an infusion after washing and drying. This infusion promotes bile secretion, and is often used as an herbal remedy for liver and gallbladder function. (Do not consume dandelion tea or infusions if you are pregnant or nursing.) The root may also be roasted and used as a coffee substitute. The plant can be brewed into beer, and the flowers into wine. The whole plant is edible ! The yellow flowers attract bees as well, making it a great plant to have around your garden. Description: Deep green, lily like plants found along streams, roadsides and lawns. The flowers are a yellow-green in appearance and when mature 7 inch spikes that resemble miniature cat-tails protrude from the center. The leaves are 8-10 inches long, oval to heart-shaped with a center rib. Flowering time is June -September. Growing conditions: Very hardy. Grows in poor soil, in sun or shade. 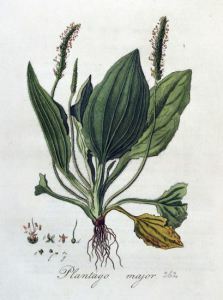 A highly adaptable plant, plantain has spread across Europe and America. Propagation is from seed carried by the wind. Legend has it a beautiful Indian maiden spent so much of her time by a stream waiting for her lover to return that she was eventually transformed into this common plant. Indians referred to plantain as “white man’s foot,” as it seemed to follow the white settlers everywhere they went.